One of my favorite books as a kid was A Connecticut Yankee in King Arthur's Court. 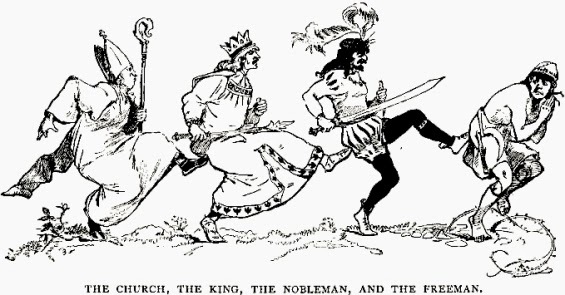 Mark Twain was inspired to write it after a dream in which he was a knight burdened by his heavy armor, and wrote a story about a man from the 1800's (Hank, the Connecticut Yankee) who wakes up in medieval England and has to survive. While people much smarter than me categorize it as a satire poking deep fun at the romanticism of the Old South, I simply thought it was a great example of what would happen if you traveled in time back a few hundred or even a few thousand years. The main character uses his 19th century knowledge and experience to single-handedly dismantle the feudal system, unmasking magic with science and everyday (1800's) common sense. My kids are now growing up in a largely demystified world, where they will never have to wonder what are the lyrics to a popular song, whether an urban legend really happened, or whether global warming truly exists. Okay, maybe not global warming, however, the wealth of information available to them, to me, to all of us on any subject is staggering. For example, not only can they find the lyrics to a song in mere seconds, but they can also find the names of every person who was ever in the band, the schools each person attended, and with some small amount of searching, the names, phone numbers and addresses of their classmates, teachers and anyone associated with the band. This kind of information, literally at the tips of fingers, has never before been available, and in certain situations, much like that of our Connecticut Yankee, a game, life and history changer. I've always realized and accepted that religion is based (almost) 100% on faith, on a belief in something that simply cannot be proven. The origins of all core religions (the Big Five – Christianity, Judaism, Islam, Hinduism and Buddhism) can be traced back historically to a point at which one either believes or one doesn't. The problem the LDS church is now facing is that belief in the church's foundations are a little different than that of the Big Five. Specifically, while their ancient origins are clouded in murky legend documented decades and centuries after the fact, LDS church's history is recent enough (a scant 200 years) that first person accounts, journals and a wealth of other documentation abounds. Not only has a staggering amount of the information been vetted by researchers and academics with a dizzying amount of clarity, but their texts, papers and even scanned historical documents are available to anyone with an Internet connection. Many, if not most, of my friends, fellow ward members and spiritual brethren have a knee jerk reaction to any statement regarding religious history and the Internet, that is: "you can't believe everything that's on the Internet." I could not agree more, and I would lump 99.99% of all Facebook posts, bloggers and any and all subjective statements, rants and theories into the "you can't believe it" bucket. However, the leftover one hundredth of one percent is the man traveling back over a thousand years and waking up with knowledge and understanding that appears magical, mystical and, to many people, unbelievable. For tucked away among the information storm that assaults each of us every time we go on-line are the nuggets of knowledge that list primary sources now available in digital format courtesy of universities, researchers and faithful members who have been searching and digging for decades. As I have struggled with my own faith crisis (translation = doubts) over the past three decades, I would find that most of my concerns led to books, authors and claims which were labeled anti-mormon, apostate, and even of 'the opposition.' Over the past few years, those labels have changed, perhaps not to the majority of the members sitting in pews each Sunday, but definitely to those who read and note the church's stance. From Rough Stone Rolling to the series of essays being released on the church's official site to the changes in curriculum and scripture headings, official church history and doctrine are being re-written to align with historical documents. Reconciling belief with fact is never easy, and a constant battle is raging, not the one on-line, but rather the one inside, in my brain, my heart and my soul. Once information is found, investigated, and confirmed, a desire to believe is never enough, there is no way to undo the learning, to go back to a former state where the knowledge did not exist. This is the conflict that I wake up with, that I labor over daily, and the one that keeps me up at night. When he's not on a plane, ​Brandon lives in Northern California, where he has giant adventures every weekend with his kids and frequents gourmet food trucks. He also knows where the best buffalo wings are in any town.